You are currently browsing the archives for the DNC category. Saying that Keith Ellison’s brain isn’t wired like real people is understatement. This article quotes Keith Ellison saying some of the wackiest things about borders imaginable. This isn’t some nobody saying this. This is the Deputy Chairman of the Democratic National Committee. He’s also running to become the next State Attorney General for Minnesota. The frightening thing is that his views on open borders aren’t out-of-step with large swaths of the Democratic Party. Wednesday, the House of Representatives voted on a resolution “supporting the officers and personnel who carry out the important mission of the United States Immigration and Customs Enforcement.” 133 Democrats, including Keith Ellison, voted against the resolution by voting present. What a bunch of cowards. If these Democrats think that we shouldn’t enforce our borders, and they don’t, they should just be honest. The key that Ellison missed is that there’s a procedure that corporations follow to conform with the laws of the different nations. If the corporations got caught not following the rules, they’d get fined. Similarly, illegal aliens are subject to fines or deportations when they attempt to enter the U.S. without obeying the rules. Bernie claims that his socialist ideas are now mainstream. That’s BS, though they’ve certainly gained in popularity within the Democratic Party. Open borders have gained in popularity, too, within the Democratic Party but that doesn’t mean that they’re mainstream with voters. The DNC’s annual 4th of July statement is as out of touch with reality as Maxine Waters or Nancy Pelosi. If they’re living in California or Illinois, I believe that women are still struggling to find good-paying jobs. The unemployment rate for women is the lowest it’s been in 60+ years. Now that people aren’t required to buy insurance policies they never wanted, health care will become more affordable. Remember that this November. While Trump and the GOP attempt to build up America, the DNC and the ‘leaders’ of the Democratic Party drift farther leftward. Will Republicans break through in Minnesota this year? That’s pretty laughable. The DFL has been well-funded for years, with DFL trust fund babies (Think Alita Messenger) writing big checks to the DFL. The DFL shouldn’t need outside help to connect with rural voters. I can save the DNC that $100,000. The problem isn’t that the DFL hasn’t reached out to rural Minnesota. It’s that those DFLers are attached to a cancer originating from Minneapolis and St. Paul. The DFL won’t like hearing this but it’s the truth: The Republican Party of Minnesota is the new home to farmers, miners and construction workers. Skipping the convention is a sign Pawlenty has trouble with the modern GOP, said David Turner, spokesman for the Democratic Governors Association, who compared the Minnesota contest to the 2017 Virginia governor’s race—which was expected to be close but turned into a big victory for centrist Democrat Ralph Northam over moderate Republican Ed Gillespie. The chance to elect, for the first time in Minnesota history, a unified Republican Party government is all the motivation Republicans will need this fall. The opportunity to fix the problems Dayton created but didn’t fix is great motivation. The opportunity to trash Minnesota’s socialist economic policies will be a great motivator, too. I’d be in denial if I said that there aren’t some people who question Pawlenty. They definitely exist. That being said, he’s a reliable chief executive who is light years more trustworthy than Gov. Bobblehead, aka Gov. Dayton. A Pawlenty-Daudt-Gazelka trio of leaders would be able to get lots of good things done. As for the DFL gubernatorial candidates, each have serious flaws. The first test for a candidate is picking a running mate. Rebecca Otto failed that test by making an identity politics choice. The first thing a running mate has to be is capable of running the state if, God forbid, something happens to the governor. DFL gubernatorial candidate Rebecca Otto has chosen Zarina Baber as her running mate, creating the possibility that if elected, Baber would be the first Muslim woman to hold statewide office in the United States. Picking a nobody with no government experience is foolish. It’s impossible to take this pick as serious. This is purely an identity politics pick. As for Tim Walz, his biggest flaws are that he’s got the worst of both worlds. He really isn’t a Twin Cities kind of guy but he doesn’t fit well with rural Minnesota, either. He once represented rural Minnesota but he lost that by playing politics with the NRA. When he pandered after Parkland, people saw that his values are ‘flexible’. That won’t fly during the age of Trump. Single-payer health care will never be the law of the land. This is totally foolish. If she wants to play to her base to win the endorsement, that’s fine. She’d better know, though, that it’ll cost her bigtime in the general election. As for the Republicans’ majority in the House, the DFL can forget about flipping it. They voted for creating the hated buffer strips that are costing farmers tons of money. The DFL sat silent about the rebuild of the Line 3 Pipeline, which would’ve helped stabilize, if not decrease farmers’ property taxes. The DFL voted against the Republicans’ tax cuts in 2017, which has limited farmers’ property taxes. It isn’t a matter of outreach. It’s a matter of voting for terrible policies. No amount of outreach will make amends for terrible policies. Swamp critters will drain swamp? Caitlin Huey-Burns’ article suffers from a credibility problem. Let’s be clear. Caitlin Huey-Burns doesn’t have a credibility crisis. It’s that Democrats have a credibility crisis. First, this won’t take the place of an optimistic economic message. Next, it’s important to notice this doesn’t have that much impact on voters. I haven’t seen a poll on this recently but I suspect that people are more worried that Jim Comey, Loretta Lynch and Robert Mueller are the least trustworthy people in DC. While I’m at it, I’d better include James Clapper and John Brennan aren’t high on the public’s credibility and integrity ratings. Informed voters have noticed that big government is pretty corrupt, too. It isn’t like people think John Brennan and Jim Clapper are saints. It isn’t like people suddenly think the FBI is the honorable agency it once was. It isn’t like the people haven’t formed the opinion that Eric Holder, Loretta Lynch and Jim Comey didn’t politicize the DOJ and the FBI. After watching this video, why would anyone think that the FBI wasn’t corrupted during the Obama administration? There’s no chance Nancy Pelosi and Chuck Schumer will “drain the swamp.” They both live in mansions in the fanciest neighborhoods of the Swamp. Now I’m supposed to believe that they’re intent on draining the Swamp? I might’ve been born at night but it wasn’t last night. Is the 2018 electoral tide turning? For the past 6-9 months, we’ve heard predictions that Democrats would retake the majority in the House and possibly in the Senate, too. According to James Freeman’s latest column, that’s looking less likely. Minnesotans are more narrowly divided on whether they are likely to vote for a Democrat or a Republican in November’s congressional elections than the rest of the country. 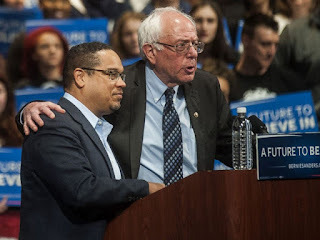 A new Star Tribune Minnesota Poll found that 47 percent are now inclined to vote for a Democrat, while 45 percent said they’ll probably vote for a Republican — a statistical tie given the poll’s 3.5 percentage point margin of error. That’s great news for the MnGOP. This will help them hold the seats they currently have while giving them a shot at flipping Tim Walz’s seat in Southern Minnesota. I’d be surprised if Democrats weren’t counting on flipping MN-3 and MN-2 while holding MN-1. If the DCCC’s dream isn’t realized, that’s a major blow to them retaking the House. Why should 2018 be any different? When lawmakers enacted the Reagan tax cuts in 1981, Republicans blundered by agreeing to delay the implementation of many provisions. Without the immediate pro-growth boost, the U.S. economy shrank by nearly 2% in 1982 and voters registered their displeasure. This notion that the party that holds the White House loses seats is statistically accurate but it isn’t automatic. Patterns are patterns until they aren’t anymore. Ninety-five percent of Democrats and the same percentage of Republicans said they’re inclined to vote for candidates from their own parties. Among independents, 43 percent said they lean Democratic and an identical percentage said they’re more likely to vote for Republicans. Based on the fact that the Minnesota Poll consistently oversamples Democrats, I’d argue that the DFL ought to be worried. This isn’t good news for the DFL. Perez started off his tenure with some lofty goals and inspiring promises. In addition to funding the Democrats’ national efforts for the midterms, the new chairman recognized that their state-level organization was in disrepair. He pledged an additional ten million dollar fund specifically allocated for state parties to rebuild and staff up for the 2018 battles. Thus far, however, Vice reports that it simply hasn’t happened. In fact, not only have they not sent ten million dollars to the state parties, they don’t even have ten million on hand. It’s still a long ways off and momentum can shift at least 20 times between now and Election Day. Still, the fundraising numbers and the popularity of the Trump/GOP tax cuts are things Republicans can feel good about heading into 2018. This is the most recent year that Democrats insist that they’ll retake the House. While it’s their best opportunity to retake it, that isn’t the same as saying they’re guaranteed to win. Then she made a statement that said “They have made the bet to pick their donors in California and New York over their voters back home.” Democrats don’t have a message but they’re well-financed. Republicans stumbled early but they’ve put together a solid list of accomplishments. Meanwhile, the RNC has been kicking the DNC’s behind in fundraising ever since Ronna McDaniel took over. None of these so-called ‘moderate’ Democrats voted for the Trump/GOP tax cuts. Then they weren’t anywhere to be found to negotiate a DACA fix. That begs this question: what identifies them as moderates? If anyone of those senators get caught near Trump, all of those donors would ditch them in a minute. They’re basically asking McCaskill and Manchin and Donnelly to do an act of levitation. Win without doing the things your voters would like you to do. The question is will the voters hold them accountable? They’re gambling they won’t be held accountable. They’re gambling that Trump is so polarizing that there are no Trump voters available to them on a positive scale. They’re thinking they’re going to have to obliterate their opponent, tear their opponent to shreds. Yet think about the margins here. Trump won Indiana and Missouri by more than 18 points. He won North Dakota and West Virginia by 30-some points. He won Ohio by 9 points. It’s not like you only need a few Trump voters to stay home, they would need a lot of them, like a third of them, to stay home. And that is just not going to happen. Heitkamp, Manchin, Donnelly, McCaskill and Brown better hope that voters didn’t notice that they didn’t support any part of President Trump’s agenda. If they notice, that fivesome is history. Ten days later, Fiat Chrysler announced that they would invest more than $1 billion to modernize the company’s Warren Truck Plant in Detroit, adding 2,500 jobs and moving production of its Ram trucks from Mexico. They also announced they would be giving $2,000 bonuses to their hourly U.S. workers. The company credited the moves to the new tax law. The Democrats have been on the wrong side of the tax cuts from the start. As these bonuses, pay raises and other positive announcements get factored in, how will Democrats defend their unanimous vote against the Trump/GOP tax cuts? The pundits talk about how the President’s party usually does poorly in a new president’s first term. I certainly cant dispute that that’s the history. What’s disputable, though, is that that pattern will apply this time. I see information that indicates it might not. When will Sen. Franken resign? Franken’s staff can say whatever they want but the truth is that he’s history. At this point, politically speaking, he’s a dead man walking. It’s just a matter of time until he resigns. It took SEVEN accusers – SEVEN – for these “champions of women’s rights” to demand an apparent serial sexual harasser to step down. When Politico published excerpts of Donna Brazile’s book, they set off a media firestorm. That firestorm required pushback by the Clinton-Media Complex. Glenn Greenwald’s article highlights the Clintons’ dishonest tactics in fighting against the truth by writing about 4 viral falsehoods. 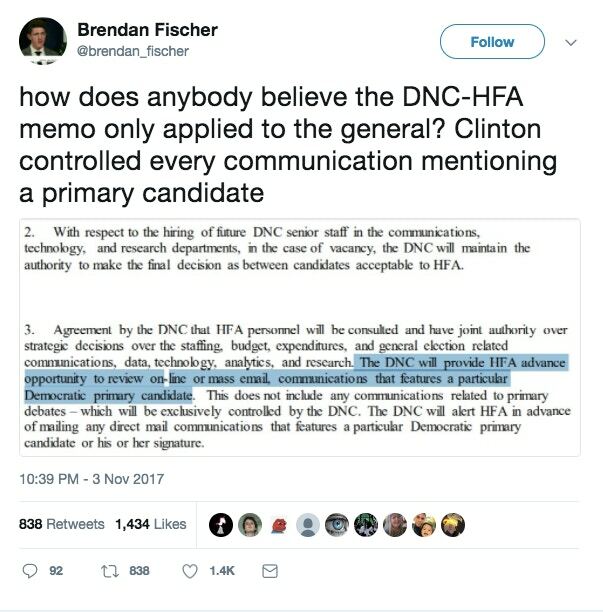 But the entire attack on Brazile was false. She did not claim, at least according to the Post article being cited, that she had the power to unilaterally remove Clinton. 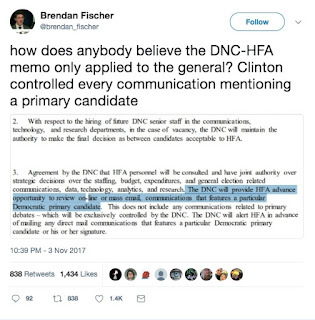 The original Post article, buried deep down in the article, well after the headline, made clear that she was referencing a complicated process in the DNC charter that allowed for removal of a nominee who had become incapacitated. It can certainly be menacing for Russian bots to disseminate divisive messaging on Twitter. But it’s at least equally menacing if journalists with the loudest claim to authoritative credibility are using that platform constantly to entrench falsehoods in the public’s mind.